NFL Makes It Official: Sarah Thomas Is First Woman To Be A Full-Time Ref : The Two-Way Confirming a long-anticipated move, the NFL has hired its first female official on a full-time basis. She has spent nearly a decade working her way through the ranks in the NCAA. Sarah Johnson makes a call during the first half of an April 2014 preseason NFL football game between the Seattle Seahawks and the San Diego Chargers. Confirming a long-anticipated move, the NFL has hired its first female official on a full-time basis. Sarah Thomas, 41, has spent nearly a decade working her way through the ranks in the NCAA. The league announced the move Wednesday, days after the news of Thomas' impending hire came out. For several years now, her name has been mentioned as a candidate for a spot at football's elite level. 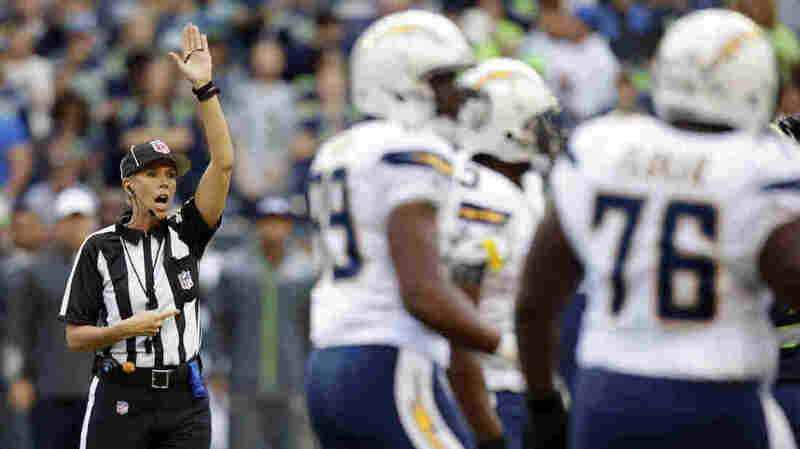 As we reported Friday, Thomas was mentioned as a top officiating candidate in 2012, when Shannon Eastin became the first woman to officiate an NFL game during the lockout of officials over a labor dispute. Eastin's NFL tenure lasted for three games. Thomas lives in Brandon, Miss. In addition to football, she works as a pharmaceutical sales representative. In the NFL, Thomas will serve as a line judge. She is among nine officials who will be working at the game's top level for the first time next season. The list also includes Walt Coleman IV, the son of official Walt Coleman, who will work his 27th season in 2015. The NFL says it employs some 119 officials; a seven-person crew works each game.